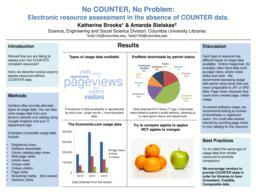 COUNTER data is not always available through database vendors for all electronic resources. We present strategies for assessing these resources. We focus on using downloads, pageviews, online searches and product registration data to assess resources that do not have COUNTER data available. Example assessments include EndNote, the Financial Times and the Economist. This poster was presented at the 13th annual ER&L conference held on March 4-7, 2018.